MiKTeX update, system says that copystart_admin.exe can't be found. In older versions of MiKTeX MiKTeX used several programs for administration (the one you named in your question). After calling it you have to choose to use it in admin or user mode (see red arrows in ithe image). That depends on your installation. If you have an admin installation (I have one) you have to update etc. first as admin, second as user. The old programs for setting, package manager etc. you can found in the place marked with the big red circle. For example click on "Package" to get the package manager. Refreshing the file data name and the font maps you can do by tasks (small red circle). Not the answer you're looking for? 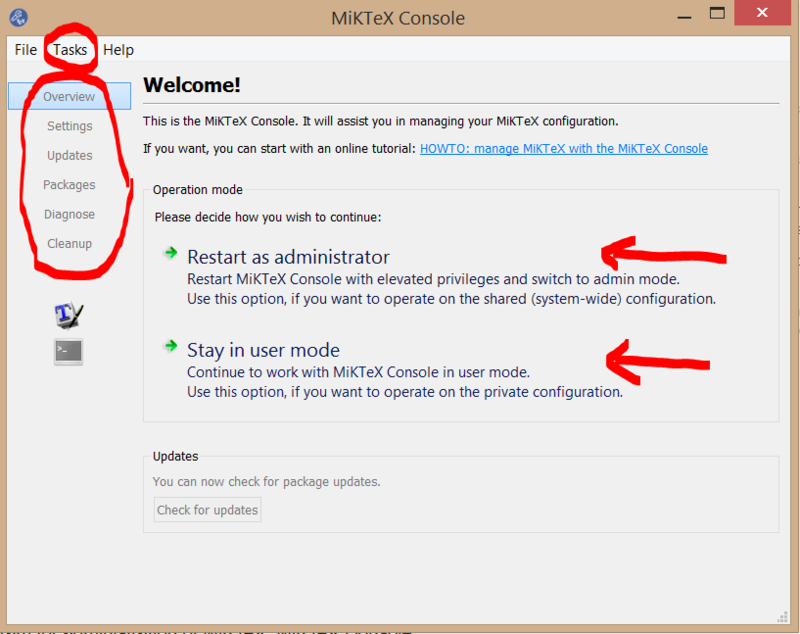 Browse other questions tagged miktex updating miktex2.9 miktex-update update or ask your own question.